The following five methods of home food preservation will enable you to not only be frugal (obtaining and preserving bulk foods on sale) but will help you build a food storage inventory (along with your dry goods and other foods). ‘Canning’ is a process in which foods are placed in jars or cans and heated to a temperature that destroys microorganisms and inactivates enzymes. 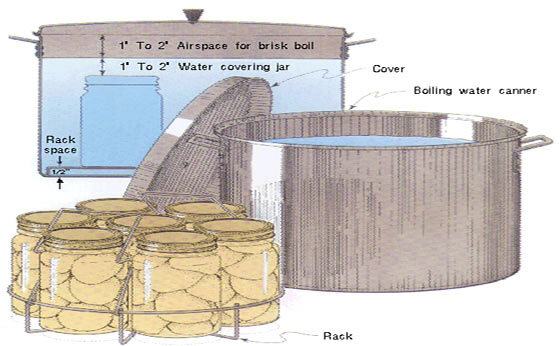 The heating (and subsequent cool-down) forms a vacuum seal against the lid which prevents other microorganisms from contaminating the food within the jar or can. Acid foods such as fruits and tomatoes can be processed or “canned” in boiling water at 212°F (also called the “water bath method”). 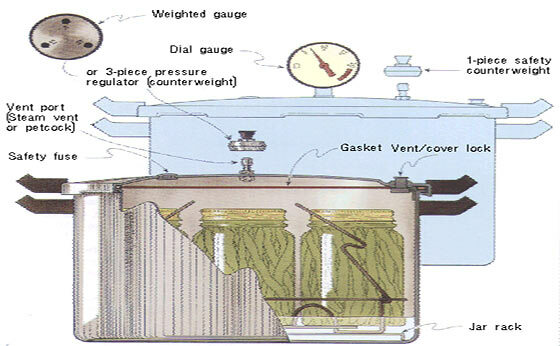 Low acid vegetables and meats should be processed in a pressure canner at 240°F (10 pounds pressure at sea level). ALWAYS follow well-known trusted canning recipes and rules. Freezing reduces the temperature of the food so that microorganisms cannot grow. Enzyme activity is slowed down (but not completely stopped) during freezing. Even though food will freeze at a temperature of 32°F, you really should keep your freezer set to 0°F or less. The reason is that low temperature microbes will still develop below 32°F, but are very much stalled at 0°F or below – affecting freezer food storage times. Drying or dehydrating removes most of the moisture from foods. Thus microorganisms cannot grow and enzyme action is slowed down. Dried foods should be stored in airtight containers (or vacuum-sealed) to prevent moisture from re-hydrating the food and allowing microbial growth. Dehydrated food has been heated at low temperatures. Since there is no high temperature ‘cooking’ or other process such as boiling, etc., dehydrated food preserves much of the food’s nutrients. Shelf life will depend on the level of dryness. Pickling is another form of canning. Pickled products have an increased acidity that makes it difficult for most bacteria to grow. The amount of acid present is very important to the safety of the product. Pickled products are also heated in jars at boiling temperatures to destroy any other microorganisms present and form a vacuum in the jar. These foods have a very high sugar content. The sugar binds with the liquid present, making it difficult for microorganisms to grow. To prevent surface contamination after the product is made and thus possible yeast or mold growth, these are either canned, frozen, or refrigerated. There are a wealth of resources available to learn how to properly utilize any of these food preservation techniques, including the internet, books, and experienced users. If you haven’t already, go ahead and challenge yourself and try any of these methods so that you can store extra food while taking advantage of garden harvests or store sales. Not only will you enjoy these foods off-season, but you will become a better prepared person or family. The one I haven’t worked with enough to be comfortable with it is pickling–I need to get that one figured out because it’s the one form that doesn’t need any external input. No fuel, no electricity. Dehydrating can be done passive as well, but usually isn’t. My solar dehydrator is cheap, simple and incredibly efficient. Nothing more than a screen stretched across an aluminum roasting pan with a glass storm window on top. I can’t believe how much output and how fast it works, easily outdoes the electric model. My elderly neighbor (92 years old) is probably the best prepper in Texas. He has just shown me how to save any and all consummables for future use without dehydrating, or canning, or freeze drying or freezing and do this without any energy consumption. The preserved consummables are ready for use at any time. He really thinks out of the box and his method always works. His idea is “go feed the pigs”. I believe I’m going to be pickling a lot of beets this season. The wife cans and I get to help. Oh well, I get to claim credit for doing “all the work.” I use a nesco dehydrator for venison jerky. Also I dehydrate jalapeno peppers from the garden. Just cut them lengthwise and throw em on the trays. I use the highest setting and make sure they are very dry. I then take the peppers and remove the seeds. Really, the seeds just fall off after drying. I then place the peppers in a blender and reduce them to a fine powder (magic dust). I recommend doing so in the shop or outside. Makes a powerful seasoning, really good on the jerky. I also keep a pepper shaker of 50% black pepper with 50% magic dust on the counter. It is great on eggs or just about anything else. Takes a lot of peppers to make magic dust, but it’s worth the effort. If you can find Thai Dragon peppers, give those a try, very tasty. Do a quick very hot fry in a Wok, no oils, just to give them a slight burnt flavor. Sounds great. I assume they can be grown in the midwest? My body doesn’t enjoy really hot peppers like it used to. I like the hot flavor but it’s just not worth the GI issues. Have grown habenero and a couple of others, but habenero is too hot except maybe in a large pot of chili. Plain ole bell peppers, bannana peppers, cayenne peppers are all a normal part of our garden. The wife puts bell peppers in nearly everything she cooks. I like them just fine and we routinely eat them fresh in salads etc. She cuts them up and freezes them for use throughout the winter. Can’t wait for red ripe tomatoes, my favorite garden goodie. The Tahi Dragons are reather warm aka Hot, but unlike most hot peppers the “burn” goes away quickly and does not burn on the way out. They are hard to find, usually only ina Nursery, not a Wally World item. I have 24 plants in….. Hope you can find some amd give them a try. And yes you can grow them about anywhere. I am unclear if Pickling is the same as Fermenting food? I make a mean Cucumber Kimchee and Cabbage Sauerkraut but my pickle attempts are pretty poor. Which gives better food value? NH Michael, there is a big difference. The fermented food is better for you. No Pickling is not the same as Fermentation. Now one can build the Sauerkraut or the Kimchee (ferment it) and can it afterwards of course. Canning fermented foods kills the probiotics that the fermenting process creates. Won’t disagree with you there, but it sure is yummmmmm. Been feeling the urge to do more fermenting. But of course, I need to be able to store the jars/crocks of goodness. Instead of keeping them in the basement on a shelf, have been considering picking up a second hand fridge just for the kimchee, kraut and other veggies. Of course if we lose power it may not end well. Good idea on the 2nd or 3rd frig for the “stinky” stuff. Also something to remember, even if the grid were to go down, the Fermented would last quite awhile afterwards. Asked her one time what about the mold that formed on top, “just scrap it off and keep eating, the mold could not effect the Fermented Foods”, something about the Yeast/Salt being a LOT stronger than Mold, now I don’t know if that’s true or not, but she lived to 93 and my Mom is now 96….. When I was stationed in South Korea I visited some Temples and saw man high Kimchee jars that fed the Monks for the whole year round. Summer (Quick) Kimchee was good on the counter (NO A/C in most Korean Apartments so steamy all summer) for a month. Winter Kimchee good for a year but VERY Pungent at the end of the jar. So in short your Grandmother was correct, Surface Mold is harmless vs. Fermented Foods. Please do not can fermented foods. Good Quality Fermenting gear from Crazy Korean (and others I suspect) will hold your kimchee’s and sauerkraut year round on your counter. I actually just use a simple 1 gallon Stoneware Crock for the Kraut and Kimchee. It usually don’t last long. You forgot one method Ken. Fermenting foods has been around longer than most other forms of preservation. NRP, also on fermented foods. Cheese is also a fermented food, and wine. Ha Ha, I like where this is going. Actually you make a very good point with Cheese. Tillamook Cheese has got to be the very best Cheese since the beginning of time. When I do my yearly trek to Pot-Land I just happen to stop by the Factory for a slight visit and 20-30 pounds of Cheese, you get a discount at the Factory. I also asked on how long it would keep, knowing the answer, they mentioned 8-10 years with no problems. So, should “waxing” be considered another method of “Food Perseveration”? Who needs “America’s Got Talent” when you can watch happy drunken pigs! Ok, you actually got an out-loud laugh on that one. Same with Cows eating rotten apples under a tree. PS; Spent Grain is great for making Bread. Seriously a recipe for using spent grains would add to my survival cooking notebooks. Actually the flavor is excellent, the Malted Grain is soft enough for the bread and the flavoring adds a lot. Talk about falling down drunk…..
– Some years ago I was looking for a place to fish near a newly built and stocked Dam in the Texas panhandle. The place is underwater now, but I came across a Chinaberry Tree with a lot of fermented fruit lying on the ground under it. There were almost as many drunk Mockingbirds lying under that tree as chinaberries. Have you ever seen a mockingbird who isn’t even able to stand up attempt to fly? Had I wanted mockingbird, I would have been able to just pick up as many as I could have wanted. Actually, I stood there for a good half hour just laughing. and I have seen both cows and pigs staggering. Mockingbirds are funnier. An old Poachers trick was to soak cracked corn in booze to acquire a easy meal. Works on Deer as well as birds. A Pole snare for bigger game is prudent as getting kicked by a drunk deer could be crippling. Or a Spear, your call. As a side thought if your interested in Squab AKA Pigeon AKA Flying Rats (All the same just better treated and fed) you can start your own Pigeon Breeding with a few drunken ex-wild ones. You just mark the “Wild Ones” and keep them penned allowing only the new production to fly for self feeding. Arabs and Italians were well known for Pigeon Towers. Don’t forget clamping and root cellars. I grew up eating shriveled up apples in April, May, June which we stored in our basement. My father had about six inches of sand covering a 6’x10′ section of the floor and we had carrots, potatoes, rutabagas, cabbages, apples and some other things depending on what was given to us. We didn’t “clamp” but I have seen it done extensively with cattle feed in Europe and it works suprisingly well. BTW damp clean sand is excellent for storing root crops, just keep the cat’s from using them as kitty litter and the rodents out of your storage. Wonder how that pepper powder would do in a super soaker water gun? That was in reference to plainsmedic’s pepper powder. I would think a very effective weapon. You don’t want the magic dust on any mucous membranes. Can’t imagine what in-the-eye would do. Don’t forget smoking! Had some lovely smoked sturgeon last week. Growing up, with your neighbor on this Texas Boy, all our excess produce was preserved, including peelings and leftovers, in the chicken flock. Only things they wouldn’t eat were citrus peeks, nut hulls, and items like peach pits. Had skimmed over an article….. Although it is true that fermenting produces beneficial bacteria, it also produces very exquisite tastes unattainable by any other method. I routinely ferment batches of produce and then dehydrate and powder it. We use it as a condiment in salads and soups. Old Chevy please look up Roman Garum the original fish sauce. I think you would be interested as it allowed preservation of fish proteins for Rome. Thank you, I’ve been aware of that product for quite some time and will look into it more now that you mention it. This is a product as I recall that goes back thousands of years. My personal belief is that fermentation was not a process that was invented but rather observed as pools of seawater in the warm sun preserved fish, seaweed. It is well know that fermented cabbage prevented scurvy in long sea voyages and I wonder if sea water, which has by the way the perfect salt/water ratio for fermenting, wasn’t used to ferment stored vegetables on the ship. Old Chevy I have said it before looking to the successes of the Past can guide your future. Or as some say Why reinvent the Wheel? Food preservation is nothing new it is just our cultural bias limit or maybe blind us to what we think as acceptable. The Human has not changed in thousands of years, our needs remain the same ASIDE from made up BS of liberals of new improved “Rights” and Sexual ID’s. As one who has surgically opened up hundreds, nay thousands of humans under the skin we are two sexes (or maybe species) Male and Female. We all have the same requirements to survive. Look to the success of the past and set aside foods good for body and soul. Your answers helped me a lot thank you for the website.